The University of Münster's Institute of Egyptology and Coptology (Germany) is now uploading data gathered between 2009 and 2016 during field research in Sudan regarding graves, small huts and stone-lined sleeping places from antiquity and the Middle Ages in Sudan. 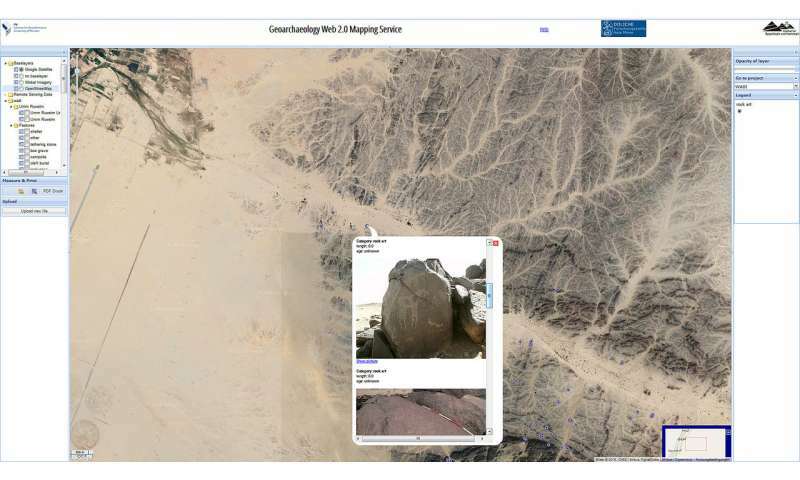 Academics, as well as anyone in the general public who is interested, can use a browser-based geoinformation system (WebGIS: http://wadi-abu-dom.de/web-gis-2/) to take a look at the findings. "By providing free access to the data, our aim is not only to meet today's expectations as regards making research transparent. What we are also hoping for is a rapid and uncomplicated exchange of data," explains project leader Prof. Angelika Lohwasser from the Institute of Egyptology and Coptology. The WebGIS was developed in collaboration with the Institute of Geoinformatics and is currently also being used by Münster University archaeologists in the excavations at Doliche, in modern Turkey, which are being undertaken by the Asia Minor research unit. A comprehensive field inspection, as well as aerial surveys of the riverbank areas of the dried-up Wadi Abu Dom river system in the Bayuda Desert in Sudan—rivers which only sporadically contain water—were all carried out as part of the Wadi Abu Dom Itinerary research project. In doing so, the team of 12 mapped all the structures of cultural and historical relevance visible on the surface of the terrain. All archaeological findings are shown as geospatial point data and area data in Web GIS and arranged by category. In addition, users can access further information for all the findings, and, in many cases, photos too. Not only academics, but also non-specialists who are interested can temporarily upload their own data into the application and compare them with those from the Wadi Abu Dom Itinerary project. This is a fast, uncomplicated way of seeing whether, and in what form, the relevant archaeological findings have already been recorded by the Münster team of researchers. "In addition to an easy link-up with research projects both at home and abroad," says Angelika Lohwasser, "what we're hoping for is public involvement. Anyone anywhere in the world who is interested, who has visited Sudan as a tourist or who is exploring these remote areas with the aid of programmes such as Google Earth, can compare any structures they have found which might be of archaeological relevance with the results gathered by the specialists. If they are not sure about something, they can contact us and—in the sense of 'people's science," in the best sense of the term—help us to complete our picture of the cultural history of Sudan."